Well, it looks like we have a bit of evidence that, contrary to an assertion by a pair of Politico reporters, it's not the media elites who can "powerfully shape" the narrative coming out of party conventions (the issue in question there was how Mitt Romney's nomination acceptance speech would be spun). The party reinstated language from the 2008 platform that said "we need a government that stands up for the hopes, values and interests of working people and gives everyone willing to work hard the chance to make the most of their God-given potential." It also reinstated its 2008 language that Jerusalem "is and will remain the capital of Israel. The parties have agreed that Jerusalem is a matter for final status negotiations. It should remain an undivided city accessible to people of all faiths." 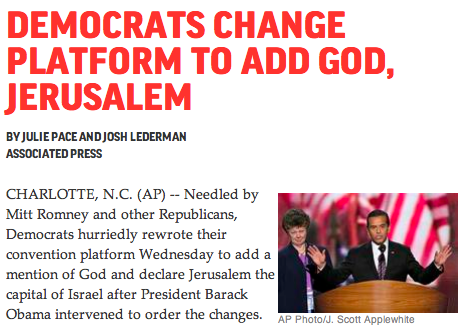 Democrats had approved a platform on Tuesday that made no mention of God or Jerusalem. Instead, it expressed "unshakable commitment to Israel's security." Let's be clear here. "Republicans" could have "pounced" all they wanted and the Democrats wouldn't have cared a bit if it weren't for the obviously very public outcry raised primarily in New Media (as Whitlock noted, Old Media largely sat it out). The episode exposed tensions on Israel within the party, put Democrats on the defensive and created a public relations spectacle as Obama arrived in the convention city to claim his party's nomination for a second term. The language in the party platform - a political document - does not affect actual U.S. policy toward Israel. The administration has long said that determining Jerusalem's status is an issue that should be decided in peace talks by Israelis and Palestinians. Obama intervened directly to get the language changed both on Jerusalem and to reinstate God in the platform, according to campaign officials who insisted on anonymity to describe behind-the-scenes party negotiations. They said Obama's reaction to the omission of God from the platform was to wonder why it was removed in the first place. If Obama really was behind this, Julie and Josh, why didn't LA Mayor Villaraigosa invoke Dear Leader as the champion of the re-insertions in an attempt to quell the controversy on the convention floor (which it almost surely would have)? And if Obama "intervened to order the changes," why did the issue come up on the convention floor in the first place? Well, they're from Administration's Press, which means that they probably won't ask that obvious question. I'm not buying what the three reporters involved are selling.